The holidays forced a bit of a hiatus with progress, but I’m getting back underway with just about a week to go. Lighting quote has been requested, bearing have come in the mail, and I got a good pep-talk about the process. A while back I met with Jon and we talked about constructing the bulk of the doors. He talked up using rigid foam for the bulk of each door and stabilizing it with an exoskeleton of plywood. It took me a while to come around to the wisdom of it, but it’s become my standard expectation. Foam Mart (LA) has styrene up to 6” thick. A sheet of 5” is 110 (retail), and a sheet of 6” is 125. I found Foam Distributors in the bay area, and have requested a quote and/or if this is their kind of project. R Tech (Home Depot) only comes up to 2” thick. doing the ply myself (with help) would be time consuming, but cheaper, and potentially have more tensile strength. Unsure about weight. 5” for $57, 6” for $66 (retail). 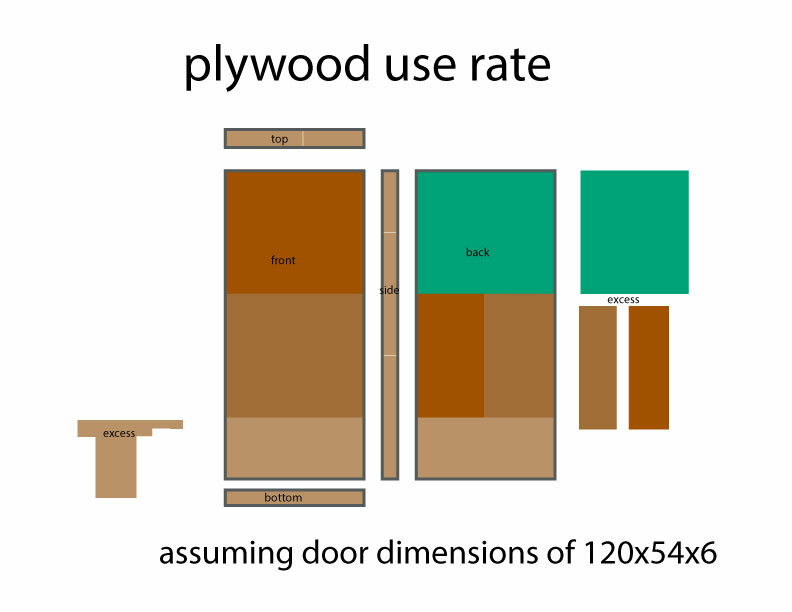 It’s possible someone needs to talk me into reducing the door width from 54 (ish) inches to 48, for better plywood coverage. This would require trimming the foam by a comparable amount. 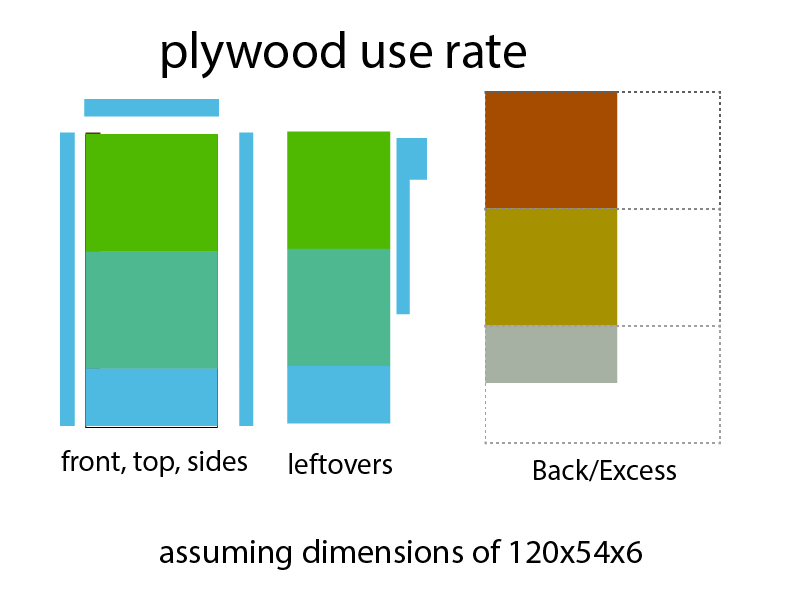 Thinking about the reuse rate for excess plywood vs excess foam. I did elect to use the full length of the bottom half of the sky blue piece to have a longest-possible piece for the pole edge, but, on further reflection, that will probably be unnecessary. Whatever lumber is showing on the pole edge will just be painted like the rest, no reason to face it with plywood. remathing on the fly. And why did it take so long for squarespace to upload this 70k image. None of the 4 large excess blocks are good for anything else within the door design. Except I can use them for the decorative elevation on the bridge. I could probably get a bridge decoration out of each individual piece, but there’s no reason to, since each bridge will have eight pieces of 48x42 plywood to service it. cost/labor trade off for the benefits of plastering over the places where the plywood pieces meet. 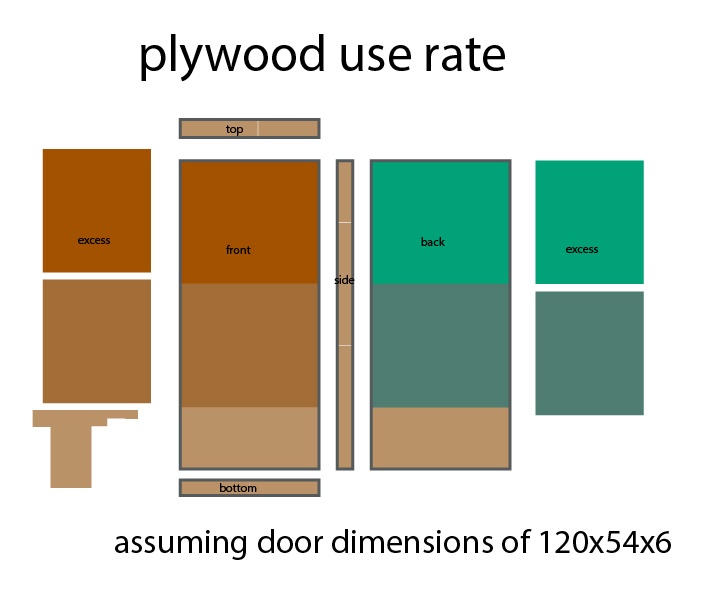 tldr, need minimum 56 sheets of plywood.